Nearly every massive galaxy has a supermassive black hole at its center. In some galaxies, like our own Milky Way, the supermassive black hole is fairly passive; in fact, the Milky Way’s black hole (Sagittarius A*) is nearly invisible, and we’ve only been able to detect it by observing its gravitational interactions with the stars and gas around it. In other galaxies, though, the supermassive black holes are a lot harder to miss. 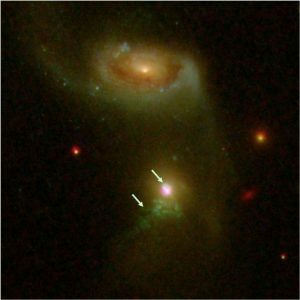 These active galactic nuclei (AGN) can take on lots of different appearances, but they all seem to be supermassive black holes that accrete large amounts of material from the galaxy. This powers tremendously energetic jets that can outshine the entire galaxy. Fueling describes how gas is accreted onto the black hole, building up its mass and powering the AGN. In particular, Comerford will discuss how fueling happens during galaxy mergers: “When you merge two galaxies together, that drives lots of gas inflows towards the center onto the black holes.” Feedback, on the other hand, describes how the black hole then produces jets or winds that can heat or even expel material in the galaxy. Both of these processes prevent the gas from forming stars, helping regulate the galaxy’s star formation; this regulation is important because we know most galaxies are not efficient at forming stars. 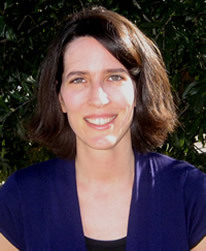 Comerford’s research on both fueling and feedback focuses primarily on the nearby universe, where she looks for galaxy mergers in general with and without AGN. “I really like things that are a little bizarre or unexpected, and trying to explain them,” she says. 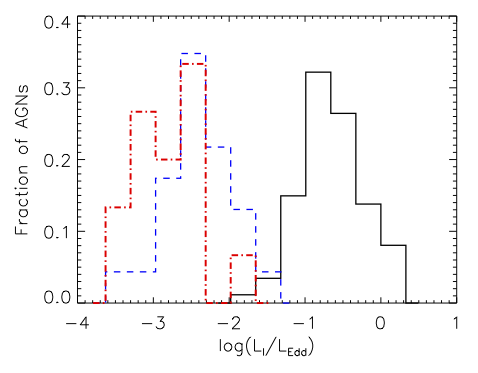 For example, she recently found one galaxy that’s had two separate feedback events (Figure 2). What caused the second outflow, nearly 100,000 years after the first one? “If you zoom out from this galaxy,” Comerford says, “then you see there’s another galaxy lurking twelve kiloparsecs away.” It turns out that interactions between the galaxies likely triggered two different accretion events, producing the two different outflows! Eventually, she filled in the rest of the picture. She knew she wanted to pursue a physics-related field, so she signed up for an astrophysics class “just to cover my bases and see what it was like.” That class hooked her on astrophysics. From there, it wasn’t until grad school that she started doing AGN research. So what advice would she give a student who hasn’t filled in the picture yet? “Surround yourself with good people,” Comerford says. Having a support network of some kind— a supportive cohort of fellow students, or good advisors and mentors—makes all the difference, and she notes that this advice applies at all career stages! If you’re interested in hearing more about Dr. Comerford’s work, or if you want to see cool pictures of galaxies, come check out her plenary talk at 12:20PM tomorrow on Wednesday, June 6 at #AAS232.